If you are looking for a travel brochure style review you are in the wrong place – this is all based on my own experience and I tell it like it is! Feel free to skip past my musings on this trip to view my pictures at the end of the post. The name’s Bond… James Bond. James Bond Island to be exact. Or, as it is actually named; Khao Phing Kan. 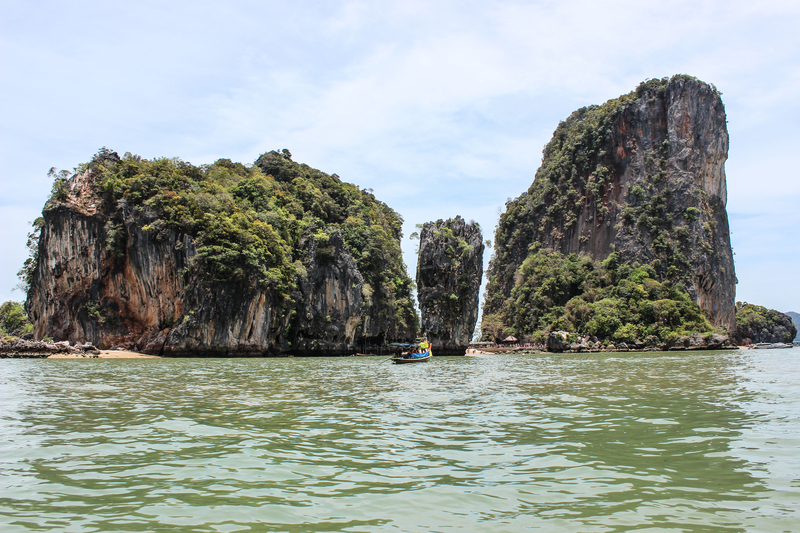 This island in Phang Nga bay was the setting for the bad guy’s lair in James Bond: The Man with the Golden Gun. It’s the one with a midget (sorry, little person) butler man and a lot of martial arts. I had my family staying with me and it was their first time coming to Thailand and it was therefore my mission to try and demonstrate to them why I haven’t come back to the UK yet, mostly so my mum stops asking me and making me feel guilty (jokes… sorry mum!). My dad has arrived armed with not one but two Phuket travel guides, and having spent many hours on not one, not two, but three flights to get here, they had all had a good look at what was on offer and had compiled a pretty jam packed list of things to do while they were here. Going to see James Bond Island was pretty close to the top. Personally, I’ve never fancied going on a trip to see James Bond Island. This probably has something to do with the fact that I don’t actually like James Bond films, or activities on or near the water. Nevertheless, the parentals were in town and the trip was being funded by the bank of mother, so now was the best time for me to check it out for myself. Luckily for us, T had recently taken some other visiting friends to see the island a few weeks ago while I was slaving away at school (how rude) and so we had a little bit of background knowledge on whereabouts to go and a rough guide on pricing. We weren’t keen on booking a package trip through an agent in Phuket as these almost always end up overpriced, overcrowded and always involve some sort of unwanted stop off at a crappy factory outlet store where you are given a free drink (yay!) and have to listen to a rubbish talk about an equally rubbish product that no-one actually wants (sad face). After a lazy morning we headed up through the north of Phuket and onto mainland Thailand, Phang Nga province. We drove for about 30 minutes, past lots of signs promising tours to James Bond Island, but these places are yet again your trusted packaged tour from your money grabbing agent. We wanted to get to the boat man ourselves and bargain us a deal. We reached a right hand turn off for can’t recall the name pier (really should have paid more attention). The car park was full of Chinese and Korean tour coaches so we knew we were in the right place only it was 1-0 to us because we didn’t have to endure a visit to the driver’s wife’s cousin’s daughter’s jewel shop beforehand – winning! No sooner had we pulled up, a rather brash woman wearing a huge sun hat was on us proclaiming, “I have boat! I have boat!” but she was quickly pushed to the side when another lady recognised T from his previous visit a few weeks ago. “My friend! You come back!” – everyone is a friend when money can be made. We were swiftly escorted to the pontoon and told to wait while a boat and driver were arranged for us for the price of 2800THB for the whole group of us. Compared to the minimum 1200THB per person that all the tour agencies want this is a good deal, and you get a boat and driver all to yourself for the afternoon. The boats could easily seat 12 people (they definitely squeeze on at least 20 Chinese/Koreans but I’m being realistic/not ridiculously unsafe) so at that price it could work out at a really cheap price per person. Our driver was called Khun Wim and he was happy to follow our lead for the afternoon. 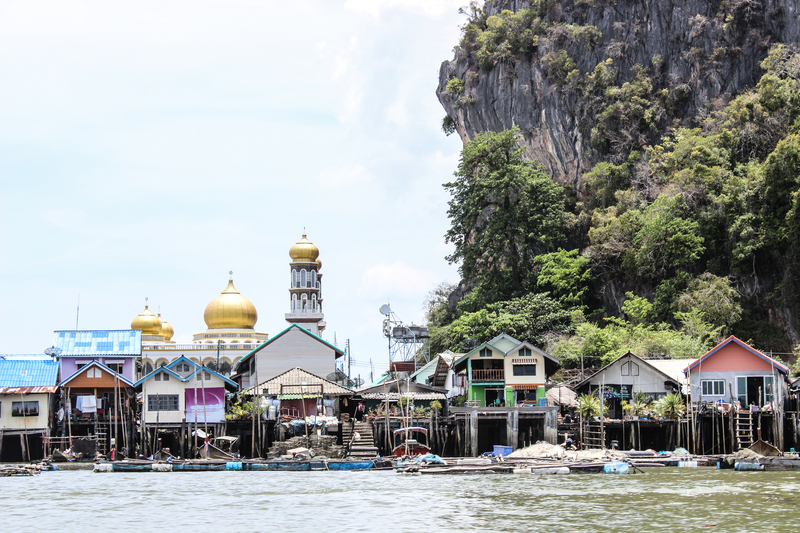 We started our journey travelling up river among the mangroves, which quickly opened out into the sea of Phang Nga bay and those infamous limestone cliffs jutting out of the water. It’s stunning scenery, but when you cast your eyes down from the ginormous cliffs you see the sheer amount of boats out on the water ferrying mostly Korean and Chinese tourists around the bay. Maybe during low season it might be a different story. Khun Wim our driver – he put on the hat especially for this picture! Our first stop was to go canoeing – this was at an extra cost to our original price but we were aware of this. We paid 400THB per person to be canoed around by friendly Thai guys who pointed out rocks shaped like elephants and took us through caves that were so small you had to lay down flat in the canoe. Last time that T went they had to pay 500THB… so the price is probably only 250 or 300 in reality. Next time…! Again, the landscape was beautiful, and it was really fun going in and out of the caves but doing so among hundreds of other people wasn’t quite the idyllic experience. I’m getting more and more keen to check this place out once tourist season is over. Next on our itinerary was James Bond island itself. Our driver told us that for 200THB per person (surprise, another added cost) we could go onto the actual island and walk around. We took one look at the island, with streams of tourists moving from crap shop to crap shop and decided we were happy taking pictures from the water. 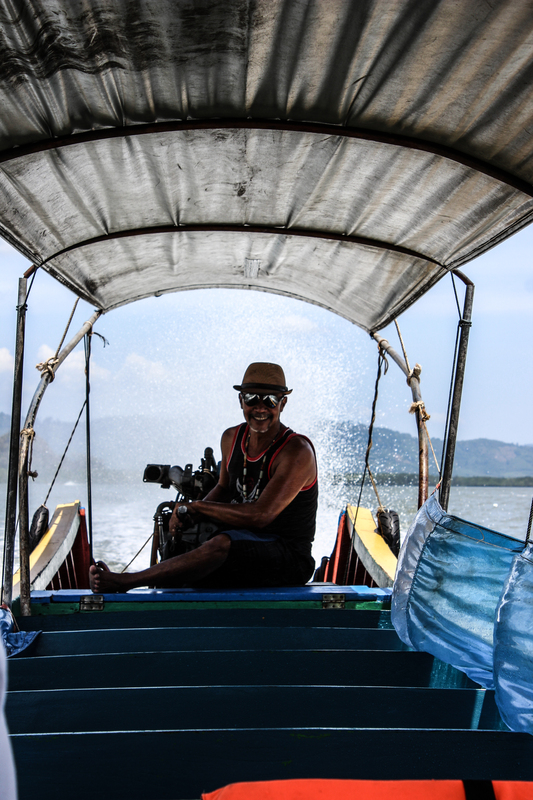 We went around the island, our driver making sure we got all the good angles and were happy with our pictures before moving on to our next destination. 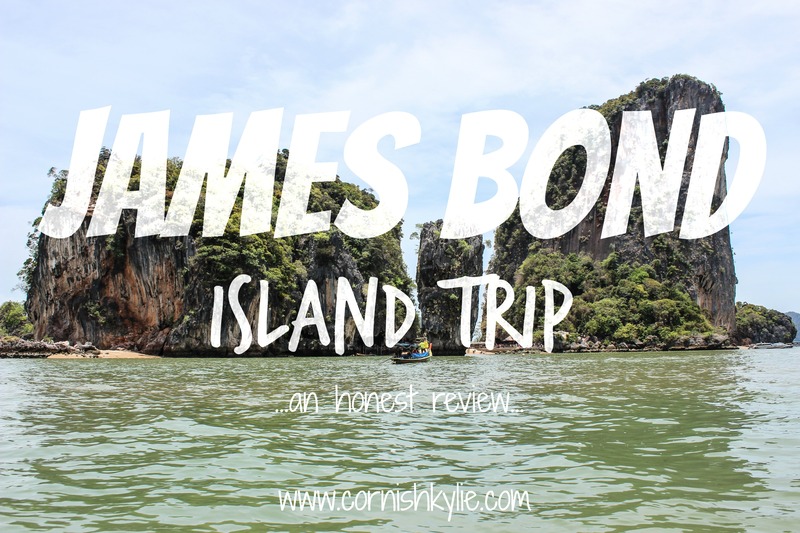 I’ll be honest; the actual James Bond island part of this trip was probably the worst bit – the canoeing and our next destination were definitely much more enjoyable. Seeing James Bond island is more to be able to say you’ve been there, and have the picture on facebook to prove it. Our third and final destination was Koh Panyee (which I have written about before here) – a place that I have always wanted to visit since seeing the story of their floating football pitch in a Thai advert and on a Vice documentary on YouTube. This floating community seem to have set up camp where the environment makes it almost impossible to do so – completely built on stilts with no dry ground to speak of – it’s a good thing they like eating fish. We had a top notch dinner stop (affording our driver to claim his free plate of fried rice) which actually wasn’t too expensive and was really, really tasty. Side note: this is a Muslim community (the shining golden mosque dominating the village is a slight giveaway) so please don’t do what my dad did, and ask for a large Chang beer while also wearing a Chang vest. Cringe. After our food we went on a quick explore through the village; we had to tunnel through endless lanes of more crap souvenier shops before getting to the parts where the locals hang out. We were mostly interested in seeing the floating football pitch, so after making our way there we headed back to our driver, who took us back to the pier where our car was parked. The whole trip was just under 4 hours long – plenty of time to do and see all that we wanted to. We kept our driver’s number this time so that we can come back during low season to see what it is like without being surrounded by other people! Here are some pictures of the day – as much as I complained about the amount of people and the little hidden costs, it was really nice to explore the area and I think the pictures say it all. Click on any image to take a closer look. They travel in large packs, barking angrily at one another and take over whole tourist spots leaving a trail of litter, spit and dirty toilets in their wake… no it’s not a pack of crazed Thai street dogs, it’s the dreaded plague of Chinese tourists that descend on Thailand at this time each year. As the nation of China celebrate lunar new year they make the most of extended holidays to travel, with tens of thousands choosing Thailand as their destination of choice. Anyone who has travelled in Asia will have experienced it – when you are in the vicinity of a group of Chinese tourists you certainly know about it. The Chinese are very fond of coach tours and will often convoy around in trains of three, four or five coaches with hundreds of tourists in each travelling group. Donning matching coloured hats or t-shirts, they traipse around in the heat en masse, blocking pathways and filling shops and blocking out views. Good luck getting a serene snapshot of your day off if you happen to be sharing your venue with a Chinese tour group – and now with the addition of the selfie stick it is practically a health and safety hazard! News stories have been cropping up of underwear being washed and dried in the airport departure lounge, purposeful damage to heritage sites, fights on planes and even one temple banning all Chinese tourists due to poor hygiene in the toilets (trust me, I’ve used a public toilet in China – it is not nice). But it looks like Thailand has had enough. Initial reports claimed that Chinese tourists were going to be banned, but before that extreme measure comes into place it looks like an official Thailand etiquette for Chinese tourists guide is on its way. I can’t wait to have a read of that. I plan on writing a guide to tourist etiquette in Thailand very soon. Will put a linky here when I do. But for now, please just at least use your common sense! Not so humble some may say, with three bedrooms and a garden that exceeds 150m in length (it goes waaaay behind the house too), boasting banana, papaya and mango trees. This picture is from before we moved in so it all looks a bit sparse – more pics to come once we are all settled in. When we moved from Hat Yai to Phuket one thing that I have always missed is our house – surrounded by the sounds of the jungle, swinging on a hammock… I just didn’t think that it would be possible unless we were willing/able to pay a premium for a beachfront property – not on my pay packet! 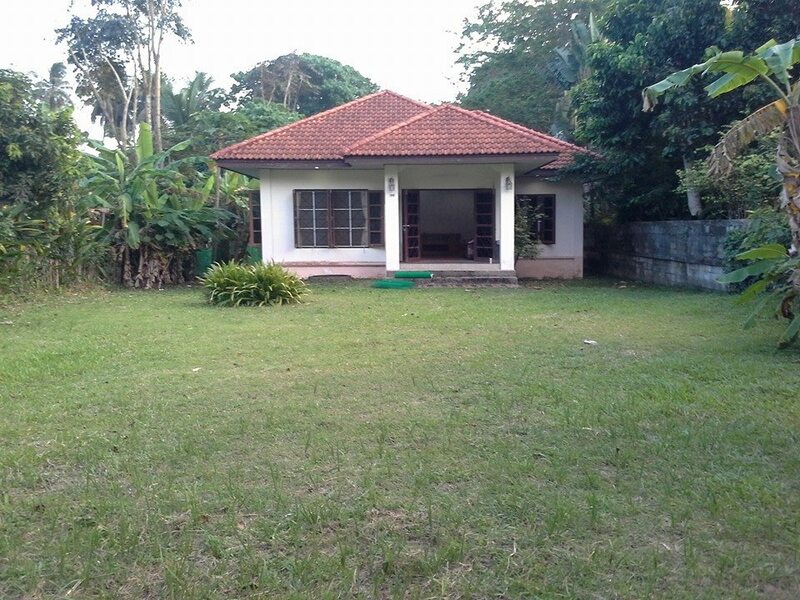 But after almost a year living in our little town house, situated close to my school and Phuket Town, it was time to find somewhere with a bit more space, more privacy and more jungle goodness. And we found it! Once again this house was not listed on any online letting sites (although you can check out DDproperty for some good options online) or any of the facebook property groups – T just happened to drive past while house hunting and saw a little sign on the gate, rang the number up (being able to talk Thai is a must in these situations) and hey presto, the house was perfect for us and we snapped it up. It’s a bit of a hike in rent, and it’s actually 3x what we paid back in Hat Yai, but a) things are generally more expensive here on the island of Phuket, and were generally much cheaper in the deep south of HY, b) my salary is more than it ever was back in HY and c) it is so worth it for the quality of living – I have jungle in my back garden! My very own fruit trees! We are very much back to the same lifestyle that we had before – chilling in the garden, falling asleep to the sounds of crickets and cicadas (it surely beats any Sounds of the Jungle relaxation CD!) and waking up with the sun (and the rather vocal cockerels that roam around the jungle…) – it is bliss! So once again we have proven that with a bit of perseverance and some local knowledge you can find the perfect home for yourself – don’t be tied down to the condominiums that so many expats feel are the only option – your perfect house is out there too!